Almost done programming an app to take care of Conky scripts. 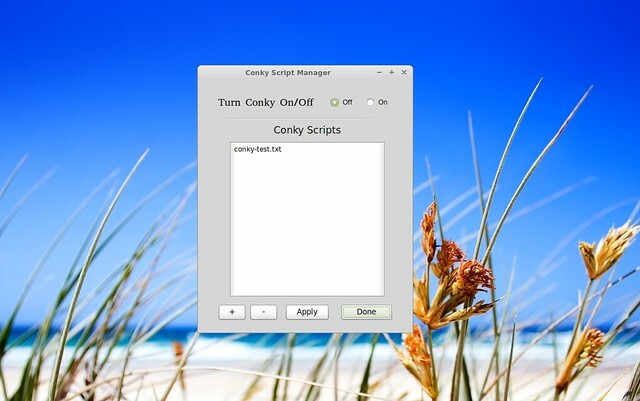 A user will be able to import them,save them and let the app make the script change so Conky can be changed on the fly. Working on a text editor for it now but I don't know if that will be in version one or two. Hope to have a couple of screenshots of it soon. OK, almost done with it and it works great but what the hell is up with Conky? Is it just me or is it when Conky is installed in Debian LXDE, it does not read the blasted .conkyrc file in /home? I see that Taco put it in /home/user/Conky and it works, how did he get it to read there? I can change my app to put the files there but how does Conky know to go there and not in /home? conky -c ~/.conky/conkyrc &This tells conky to start, "-c" to check in a directory, and then the path to the file. In LXDE you will probably have to change the .desktop file in the ~/.config/autostart directory to reflect this. To get the conky script to stick after reboot you probably need the script to modify that file. I LXDE you need to add a desktop file in the ~/.config/autostart directory. (For one person, if you want it started for all, you will add it into /etc/xdg/autostart, and there is also one more method, adding "@program" in a file... see the LXDE wiki for more). If no desktop file exists you can create it. I think I can change the last line of this desktop file to false. In Archlinux, the .conkyrc I have is directly under my home. All configuration files tend to be placed into ~/.config/ in their own directory, (except for the ones which use lots of space. )which is cleaner and easier to manage. don't know if you've seen this, but benoitfra, a crunchbang french user, made a little apps called cb-conky-tool. it can start/stop/edit/add to autostart any conky. it's in french but easily understandable. if you need help in translation and/or infos, let me know. Hey, thanks for that. It look kinda cool and useful. Found a bug when I installed it into my experimental Bobcat iso. the little cross on the top-right corner of the apps is not here to kill conky-switcher but to stop all conky. i don't have issue with it. i've included conky-switcher directly to my build env for livarp : https://gitorious.org/livarp/livarp_039/trees/master/config/chroot_local-includes/usr/local/bin/conky_switcher . I am so sorry, that last post was not meant for you.....so sorry. I was testing the conky manager that a friend and I made and found a couple of bugs in it but I fixed them and it runs like a charm for now. Thanks you for your interest though, hope you might try this app out too someday.